MOSCOW, May 9. /TASS/. Advanced weaponry rolled through Moscow’s Red Square as Russia celebrated the 73rd anniversary of the Soviet Union’s victory over Nazi Germany in the Great Patriotic War of 1941-1945. The parade was reviewed by Russian President, Supreme Commander-in-Chief Vladimir Putin. In his speech at the military parade on Red Square, the Russian leader stressed it was the Soviet Union that decided the outcome of World War Two and Russia will resist attempts to deny this feat. "Today there are attempts to deny the feat of the people, which saved Europe and the world from slavery, from extermination and from the horrors of the Holocaust, and attempts to bury in oblivion the authenticity of the heroes, falsify, re-write and distort the entire history," the Russian president said. "We will never allow this," Putin stressed. The Victory Day parade was opened by 33 foot formations comprising over 13,000 servicemen marching across Red Square. They were followed by a mechanized column that included advanced Armata tanks, Kurganets infantry fighting vehicles, Bumerang armored personnel carriers and Koalitsiya-SV howitzers. For the first time ever, Terminator tank support combat vehicles, the Uran-9 combat multifunctional robotic system and the Uran-6 multipurpose mine-clearance robotic vehicle rolled through Red Square. The air component of the military parade was opened by the Mi-26 helicopter accompanied by four Mi-8AMTSh rotocraft. They were followed by Mi-28N, Ka-52 and Mi-24P helicopters. The parade’s flyover part also included Tu-160 strategic missile carriers, Tu-22M3 and Tu-95MS long-range bombers. The military transport aviation was represented by three Il-76MD aircraft and the Il-78 aerial refueling tanker that simulated mid-air refueling with a Tu-160 bomber. 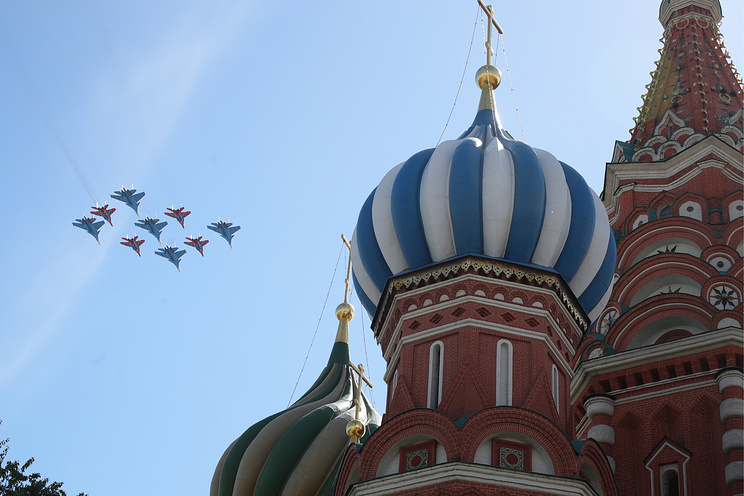 After the flyover of four MiG-29SMT light fighter jets, Su-24M frontline bombers, MiG-31BM interceptors and Su-34 fighter-bombers, a pair of Russia’s fifth-generation Su-57 planes flew over Red Square for the first time. The cutting-edge fighter jets were followed by Su-34, Su-30 and Su-35S aircraft. Six Su-25 ground attack planes that flew over Red Square traditionally emitted the smoke in the colors of the Russian flag. The air component of the military parade was concluded by the flyover of two MiG-31K fighter jets carrying the most advanced Kinzhal hypersonic missiles.